Cut two pieces of 14 count / 28 count piece of fabric approx 5 _"" x 7" (one for the back and one for the front of the design). 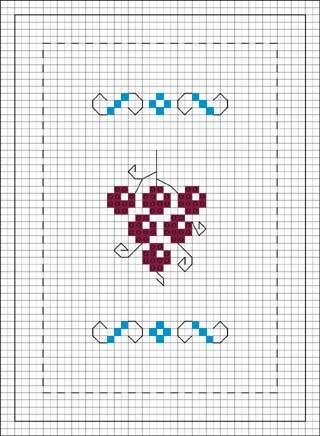 The dotted black line on the chart is where you should stitch the front and the back together. The solid black outer line is where you will cut the fabric once the stitching is completed. I would suggest using Fraycheck or similar around this cut edge to prevent the fabric from fraying. 3. Fold over the top edges of the fabric to the back of the embroidery and lightly press so it holds its position. 4. Carefully turn your fabric the right way round so the right side of the embroidery is now on the outside. 5. Push the two top edges of the fabric together, with the pre-folded seams now on the inside. With matching thread, carefully ladder stitch the two sides together. When you get to the middle stop sewing and through the remaining gap fill with some dried uncooked rice or bran (this gives it some weight) or some fibrefill toy stuffing. 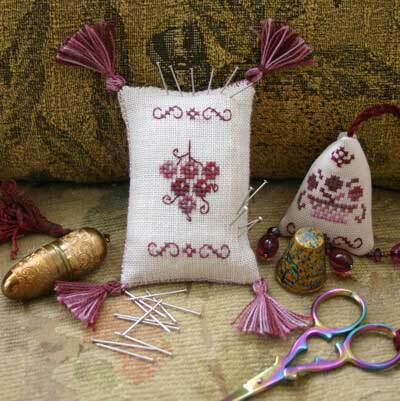 You may prefer to make a small muslin bag filled with the stuffing of your choice and then place it inside the pincushion prior to stitching the seams together to prevent the filling from coming through the linen fabric. This could depend on the weave of the fabric you have used. Now finish stitching up the remaining gap. 6. In each of the four corners apply some small tassels or apply a beaded fringe around the four sides to make it more decorative.